Product prices and availability are accurate as of 2019-04-24 08:08:05 UTC and are subject to change. Any price and availability information displayed on http://www.amazon.co.uk/ at the time of purchase will apply to the purchase of this product. 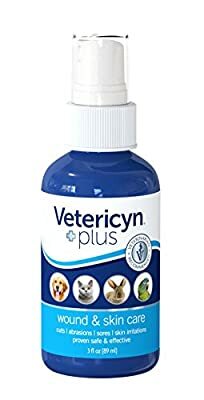 Vetericyn Wound & Skin Care is an amazing product to have in your home as it helps to provide relief for allergies, it helps to promote the healing process in many areas such as cuts, abrasions or scratches and is completely non-toxic and safe for all species. Please check with your veterinarian if you have any concerns! Damaged skin can use some extra care. The skin care from Vetericyn promotes the supply of blood, oxygen and nutrients to the wound, allowing it to recover more rapidly. In addition, the spray reduces the production of histamine, a substance that causes itching, among other things. The spray can be applied directly to the skin or to the bandage. Remove excess hair from around the affected area before using the spray. You can then apply the treatment to the wound. You can repeat this three to four times daily. Vetericyn can also be applied every time you change the bandage. The spray is safe to use around the mouth, nose and eyes. Vetericyn Wound & Skin Care Spray is available as a pack of 120 or 250 ml. Electrolysed water (H?O)(99.97%), sodium chloride (NaCI), sodium hypochlorite (NaOCI), & hydrogen hypochlorite (HOCI). Suitable for: Cuts and scrapes, Abrasions and scratches, burns, Hot spots and skin rashes, abscesses and sores. also suitable for post-surgical sites. Available in spray and hydrogel forms in an aray of different sizes.